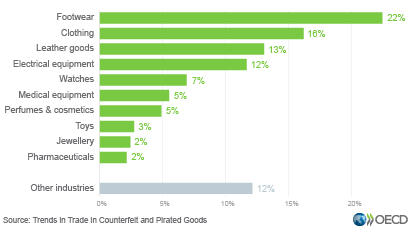 According to this new report, Trends in Trade in Counterfeit and Pirated Goods, the value of imported fake goods worldwide in 2016 reached 509 billion US dollars, up from 461 billion US dollars in 2013 (2.5% of world trade). For the European Union, counterfeit trade represented 6.8% of imports from non-EU countries, up from 5% in 2013. These figures do not include domestically produced and consumed fake goods, or pirated products being distributed via the Internet. Trade in fake goods, which infringe on trademarks and copyright, creates profits for organised crime gangs at the expense of companies and governments. Fakes of items like medical supplies, car parts, toys, food and cosmetics brands and electrical goods carry a range of health and safety risks.